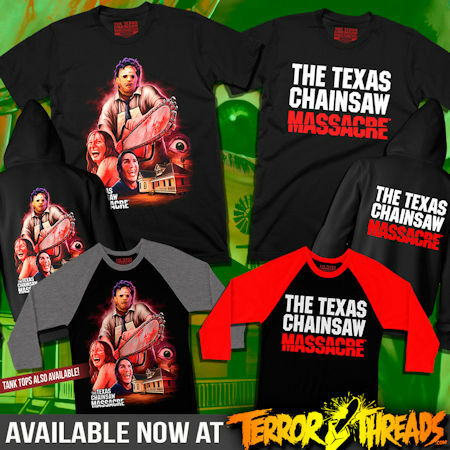 In a short span of time, Terror Threads has made an impact on the horror scene by releasing official merchandise for genre favorites both classic and current. The company continues its impressive run with new The Texas Chainsaw Massacre and The Houses October Built collections. 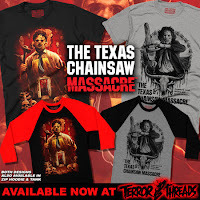 Terror Threads honors the legacy of filmmaker Tobe Hooper, who passed away in August, with a tribute to his magnum opus: The Texas Chainsaw Massacre. The collection includes three designs with Leatherface, the iconic killer from the 1974 genre-defining classic, along with a fourth design featuring the film's official logo. 2014's The Houses October Built plays like a found-footage love letter to haunted attractions, and Terror Threads shows some love back with two new shirts. 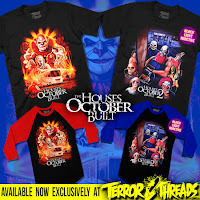 One design is dedicated to the original, while a black light-reactive design has been created in honor of the new sequel, The Houses October Built 2. The Texas Chainsaw Massacre and The Houses October Built collections are on sale now exclusively at TerrorThreads.com. The designs are available on T-shirts and baseball tees, with select styles on tank tops and zip-up hoodies as well. 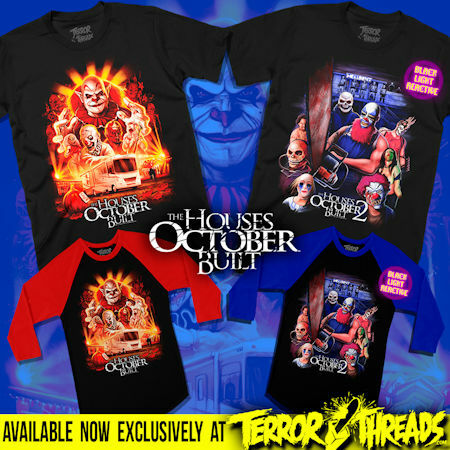 Terror Threads also carries exclusive, officially-licensed apparel from John Carpenter's Halloween, Sleepaway Camp, Puppet Master, and more, in addition to original designs. To order these and other designs visit TerrorThreads.com.